PROC TRANSPOSE helps to reshape data in SAS. This tutorial explains the basic and intermediate applications of PROC TRANSPOSE with examples. It's a very powerful procedure when you need to change the shape of the data. For example, you have data in vertical (long) format and you are asked to change it to horizontal (wide) format. It can be done via data step as well but it would be a complex code which takes a lot of time to write and test it. To save programming time and maintaining the accuracy of the code, we should use TRANSPOSE procedure to restructure data. Let's create sample data which is used for explaining the TRANSPOSE procedure. 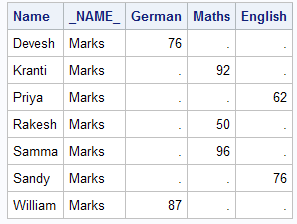 Suppose you have data for students with their marks in respective subjects. In the data set, you have three variables 'Name', 'Subject' and 'Marks'. See the table below showing this data. It creates a data set named 'TRANSP' which is stored in WORK library. The above code creates a data set called outdata which contains values of variable 'Marks' stored in horizontal (wide) format. In other words, it transposes only variable i.e. Marks (which is numeric). It is because by default, PROC TRANSPOSE transposes all numeric variables in the data set. 1. The NAME= option allows you to change the name of the _NAME_ variable. It is the name of the variable that is transposed. 2. The PREFIX= option allows you to change the prefix "COL". It is prefix to the transposed values. Observe the above code with the previous section code - There are two changes in the code above that are : specifying name 'VarName' to the variable Name. The other change is adding a prefix 'Student' to the transposed marks. 1. ID - [Move to Column Name] It allows you to include the values of a variable as variable names in the output data set. In other words, it tells SAS to give the variable names in the output file which were observations (rows) values in a variable in the input data set. If the variable in the ID statement is numeric, an underscore will be put by default at the beginning of the variable name. Instead of a default '_', you can use PREFIX= option to give a specific prefix which can be any character value. For example, you want to add 'Height' as a prefix which would create variables like 'Height20' 'Height 30'. 2. BY - It allows you to transpose data within the combination of the BY variables. The BY variables themselves aren’t transposed. The variables need to be sorted before running PROC TRANSPOSE. You can sort the variables with PROC SORT. 3. VAR - [Transpose Column] It lists the actual data that needs to be transposed. If you do not include a VAR statement, the procedure will transpose all numeric variables that are not included in a BY statement or a ID statement. If you want to transpose a character variable, a VAR statement is required. In this case, the variable 'name' is used for naming variables. Suppose you want to change the structure of data in the manner in which the row values of the variable 'Subjects' come at top i.e. heading / variable names and marks under the respective column in the output dataset. In this case, we need to sort the data as we are going to use BY processing in PROC TRANSPOSE. In this example, we are specifying variable 'Name' in the BY option which means we do not want to transpose this variable.. The variable 'Marks' specified in the VAR option implies this variable is actually transposed and shape of the data format would be changed in the output data set. If you look at the output above, everything looks perfect except the variable '_NAME' which is not relevant. We can eliminate this variable with DROP= option. Is SORTING required when i use BY statement? Answer is No. The NOTSORTED option tells SAS that data is not sorted and it is not required to sort it. If you don't specify NOTSORTED option, you need to sort the variable that is listed in BY statement. See the above output. You must have observed the names are not sorted in the output data set. We can use DELIMITER= option to separate values of two variables specified in the ID statements. In this example, we have used underscore ( _ ) as a delimiter. 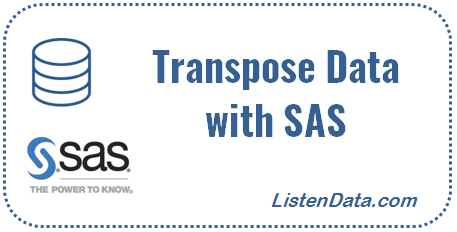 The ID statement tells SAS to provide variable names to the variables after the transpose. But if you want to label these variables, you can use IDLABEL statement which picks labels from a variable from the input file. Suppose you have monthly financial data. You need to convert long formatted data to wide format. The final output should like the following table. In this case, the variable 'Month' specified in ID statement is a numeric variable. Hence, we have added prefix 'balance_' to make it to the desired output. In this case, the information of the 'Revenue' and 'Balance' variables are stacked to one variable. And the variable 'x1' refers to the values corresponding to it. 18 Responses to "SAS : PROC TRANSPOSE with Examples"
Hi please chk the above mentioned code it is not providing the desired output. There were some typos. I have corrected it. Thanks for highlighting! Hi There, As the name here in the dataset does not contain repetitive names then it is working fine but what if we have below scenario? What is to be done in this case? 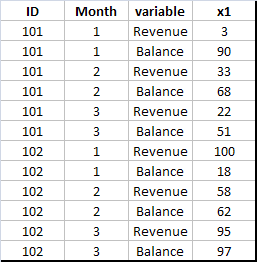 I Have transaction dataset in which I have a column of expenses I want to keep all transactions side by side using comma based on the account id wise.Below i have mentioned small scenario of the one. I want all expenses in one column side by side using deimeter as comaa, I want it as below in SAS, Can anyone please assist me in doing this will be a great help for me.